The University of Alaska provides all students, staff, and faculty with a UA Google account. Access is primarily through the webmail interface, though it can be configured to work in various email clients. The Statewide Office of Information Technology has provided documentation on common questions and issues on their website. Because these accounts are run through Google, you will have full access to Google Apps, including Mail, Calendar, Drive, Docs, etc. 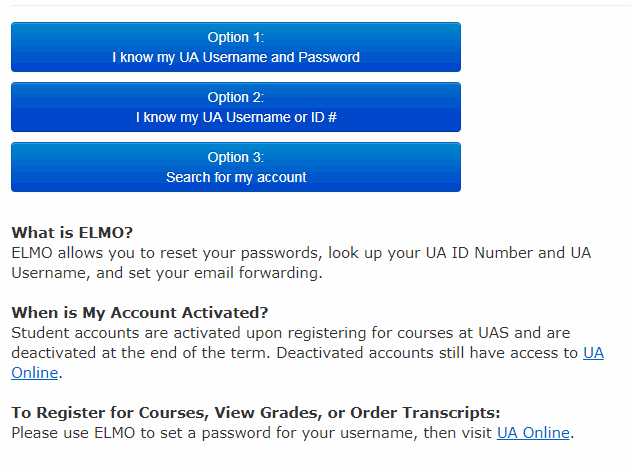 All email aliases (username@alaska.edu, first.last@alaska.edu, username@uas.alaska.edu and first.last@uas.alaska.edu) will forward to your Email Destination set in ELMO. Employees can also update available email aliases from the Email Destination page in ELMO or by logging in directly at http://uas.alaska.edu/pub/emailalias. This page generates a list of available alternatives such as f.last@alaska.edu or first.last@alaska.edu. If there are additional aliases you would like to use, please contact the Helpdesk. Please note: once activated, these aliases will be permanently assigned to your UA email account. UAS is in the process of disbanding the Exchange server. It will no longer be accessible once the server has been shut down, though the date of this has yet to be determined. New Exchange accounts are not being created. Existing accounts are temporarily available for users to migrate their mail to Google. There are two ways to access this email: through webmail by browser interface or through Microsoft Outlook client. This is for archival purposes only, as new emails will direct to your email forwarding location, defaulting to your UA Google account. This email server is an Exchange server – a product provided by Microsoft that includes other functionality such as Calendaring and Task management among other things. It also integrated our Voicemail system. Voicemail is now archived through UA Google, or your forwarded email address. If you haven't already done so, visit ELMO to look up your username and set your password. You will then be able change your account security settings and set your preferred email destination. You can also use ELMO to update your password at any time, such as if you forget it, it expires, or you suspect its been compromised. 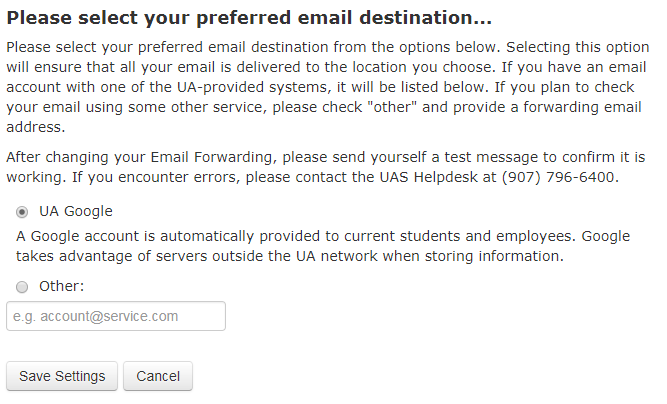 Web mail users can access their email at UA Google webmail without set up. Users on UAS managed computers can easily configure Outlook to recognize your Google account (see UA Google Access tab). UA Google is a universally accessible system, as it is not located on University grounds. 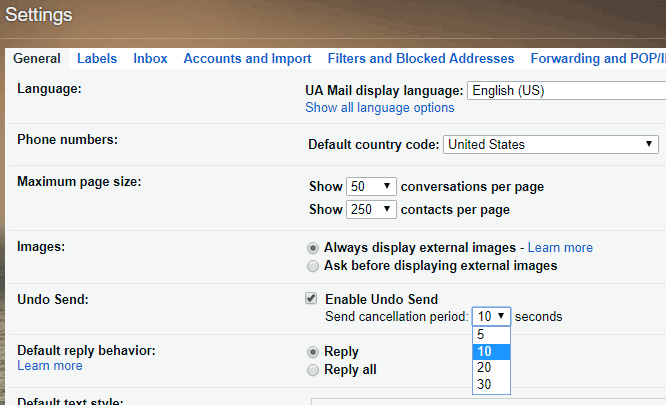 The primary way to access UA Google is through the webmail interface. It is available anywhere you have an internet connection. To access your UA Google mail within Outlook, you will need to initially run the G Suite Sync for Microsoft Office (formerly GASMO) tool, available through Google. This tool facilitates a mailbox sync with Google, running in the background with Outlook. This ensures that your inbox and calendar remain up to date. See the Management tab for tips to improve Outlook's effectiveness. If you have not migrated your mail from the Exchange server, follow the instructions in the Exchange (Legacy) tab. Mac Mail (Stamp Mail) is the University-preferred client. Google does not currently support Outlook for Mac. Statewide has provided instructions for setting up other mail clients to access Google on their website. UAS can only provide limited troubleshooting for these clients. Once you've logged in to Google webmail, you can access any delegated accounts you have access to by clicking your profile button in the upper right (by default, an image of your first initial). This will populate a list of all of the delegated accounts you have access to. If you do not see one on the list, please contact the email account manager and confirm both that you have access, and that the account has been migrated. If it still does not appear, please clear your browser cache before contacting the Helpdesk. After configuring G Suite Sync in Outlook, you can add additional delegated accounts through G Suite Sync. E-mail management is important because it allows for efficient inbox use and avoidance of lost emails during crucial moments. A few simple measures will ensure that your e-mail is decluttered and message ready. While UA Google does not have a mailbox limit, a cluttered inbox makes it difficult to keep track of emails. Screen messages in the inbox regularly to help prevent clutter. Keeping your inbox clear makes it clear what emails have been dealt with, and what still needs to be addressed. Create a folder structure to organize your emails. This makes it easier to find the specific email you're looking for, and gives you a reference point for how much content a topic receives. Some folders such as Trash and Drafts accumulate a lot of messages that are no longer needed. Delete the contents of these folders on a regular basis. The Statewide Office of Information Technology has supplied instructions from Google about connecting your mobile devices. Please note: to connect to a UA Google account enter username@alaska.edu as your username/email. Additionally, you can activate Google Calendar access on your iPhone. From the current page, you can turn Calendar sync on. Google calendar sync settings are naturally deselected; go to the Google Calendar for iPhone page to pick which calendars you want to sync with your UA Account (you will be prompted to log), then click save. Calendars won't appear right away, but will gradually appear within a couple minutes as background processes complete. For other devices, or as an alternative to the standard Google option, you can input the server information manually. There are countless devices that are available on the market, and while many will work with our new Exchange server, some will not. Below are the developing guidelines for setting up your mobile device. Many smart phones and other devices (tablets, etc) can connect to our mail server. If possible, you will want to configure your connection as an Exchange connection to have access to the additional features such as calendar or contacts. Configuring your iPhone/iPod Touch to access Exchange These steps will enable your iPhone/iPod Touch to connect to the Exchange server enabling you access to Email, as well as (if interested), the exchange calendar and contacts. These instructions were created on the new iPhone 3Gs with software version 3.0.1. If your iPhone/iPod Touch has a different version of software, these instructions may not look precisely the same, but should still work. Your iPhone should now be connected to Exchange. By default, the exchange email, contacts & calendar will be pushed from the server to your phone meaning that it will update automatically as new items are available. UAS managed and Departmental computers are configured to automatically pull your information from the Exchange Server. They may have some settings grayed out or hidden due to pushed campus policies. Simply open Microsoft Outlook and select all default prompts. Being on the UA Domain will enable your computer to automatically populate settings for Exchange. 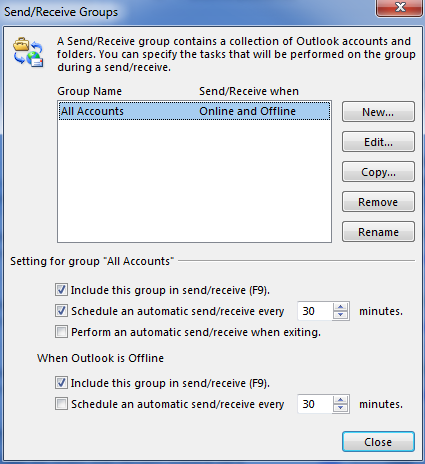 If you have a departmental shared account you can add it to an already-configured Outlook through these steps. Please note that you cannot connect to an Exchange shared account on a Google profile in Outlook. Alternatively, after you've logged in to your personal account, choose the dropdown list by your name (top, right of screen) and select "Open another mailbox...". Type in your "SHARED-ACCOUNT" name, and select Open. The shared account will open in a new tab. Please note: when configuring your mail client, make sure to check any Outgoing field that states it Requires Authentication. For full access to Exchange content, we recommend connecting to the campus VPN. Once connected to VPN, please refer to the above settings for campus users. Google handles mail a little differently than your Outlook client. To minimize errors during the migration process, consider performing a little folder management and clean-up prior to migrating your data from our Exchange server to Google Apps. New Change: Google supports a labeling system for organizing mail (vs Exchange's use of created subfolders). Nested folders will be labeled with all the folder names where messages are organized. The new labeling system will still allow users to organize and retrieve information. Outlook will still display labels as a folder structure. Remove special characters from your Outlook folder structures. The removal of special characters will ensure the smoothest conversion of folders and messages. Move Inbox subfolders to another location. Moving your Inbox subfolders will result in properly named labels. Delete unwanted and/or unnecessary emails and empty your Deleted Items. A little cleanup will help reduce the amount of data and amount of time to migrate your content to Google. 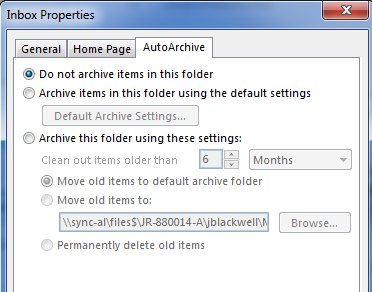 After you have cleaned up old emails, right-click the Deleted Items folder and select Empty Folder from the drop-down menu. Turn off Cached Exchange Mode. Cached Exchange Mode controls how much content is located locally vs on the server, and interferes with migration. It can be turned off by accessing Account settings, selecting the account from the Email tab, and clicking Change. Beneath the Offline settings is a checkbox for Use Cached Exchange Mode; make sure this is OFF, then restart Outlook. Google provides a tool which will migrate your content to Google (if you wish) and then synchronize the desktop Outlook with Google. Then it will copy all the content from Google back to your local computer so it can be accessed from Outlook. The synchronization tool ensures that all the same content appears in both Google web and Outlook. Please view the Pre-Migration Steps below if not already completed. Remove connections from all shared mailboxes/calendars in Outlook. Go to File -> Account Settings -> Account Settings -> Click Change. Click "More Settings" -> Click the "Advanced" tab -> Remove all shared accounts. Return to your Outlook and confirm the shared account are removed from your folder list. Download the G-Suite Sync for Microsoft Office (GSSMO) tool. A Google login window will appear. Enter your Google email address (username@alaska.edu). If you encounter the error message "Failure to find application," make sure to set a default browser. A new webpage to grant permissions will open. Click on the "Allow" button at the bottom of the page to give the migration tool access to your Google account. Check "Import data from existing profile." Select the data you wish to migrate. Click "Advanced Settings" and verify that "Turn AutoArchive Off" is checked. The migration should begin and will take approximately an hour for every 3000 messages. You will be provided a status bar. When completed, start your Outlook client. 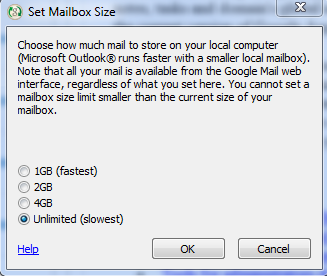 Once the Google to Outlook sync has begun, you can set your mailbox size limit. This specifies how much mail is stored on your local computer. By setting your limited to "Unlimited" you should have access to ALL your normally accessible messages, contacts, and calendars via Outlook. Click on the G-Suite Sync for Microsoft Outlook (GSSMO) icon in your taskbar. Select "Set mailbox size limit..."
Select "Unlimited" and click the "OK" button. To add the University email directory to your Outlook client, you will need to add an LDAP address to your account settings. Enter "ldap.uas.alaska.edu" in the text input box. 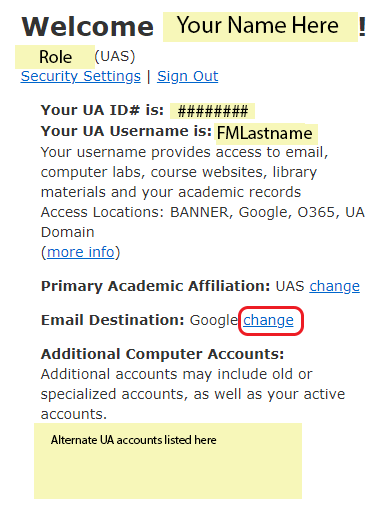 Once your email has been switched to Google, you can connect directly from the UAS Single Sign On to Google by clicking the "Email/Calendar" link at the top of any UAS web page or in the UAS web portal. You can also sign into Google directly. To move your content from Exchange into Google, you can use the Google App Migration for Microsoft Office (GAMMO) tool. Disconnect from all shared mailboxes/calendars in Outlook. Remove special characters from folder names. Move any Inbox subfolders to a different location. Download the Google Apps Migration for Microsoft Office (GAMMO) tool. Sign-in with your username@alaska.edu credentials. Log into Google Apps UA with your username and password. Select "Outlook" from the drop down menu. Choose "Migrate all data" and then click Next. Select the data you wish to migrate (Calendar and Email Messages) or select based on date of messages. Wait for migration to finish. Please feel free to visit the Google document on a detailed list of Known Issues with the Google Apps Sync for Microsoft Office tool. Google provides additional information about unsupported Google Calendar features. It is highly recommended users remove special characters from mail folder names for a smoother transition. Users are encouraged to move sub-folders within the Inbox to another location. Migration tool needs lots of space. Verify you have at least 2x the amount of free space on your local drive before you run the Google Apps Synchronization Tool for Microsoft Office. Disable shared mailboxes before migration. Remember to disconnect from any shared mailbox before you migrate. Otherwise, the Google tool will make a copy of the shared accounts in your individual Google account. This is a known issue, where an indeterminate number of sent emails do no have "to" addresses, after migrating. We are currently researching the issue. Many factors can cause mail not to properly migrate. Make sure that Cached Exchange Mode is off in Outlook, ensure that you elected not to set a time frame in Google Suite Sync for Microsoft Outlook, and make sure that your internet connection isn't disrupted while migrating. Mail filters do not migrate or sync. Mail filters created in Outlook will not migrate to Google. 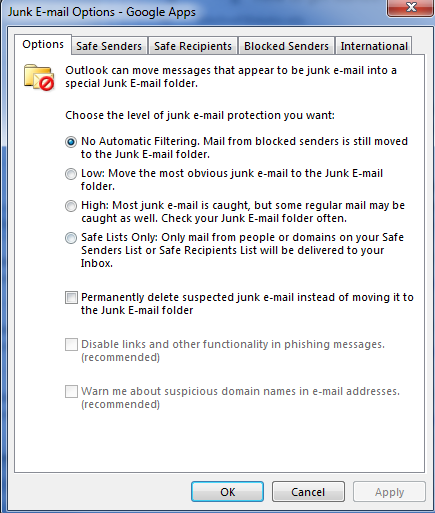 You can recreate your mail filters in either Outlook or in the Google web interface. Nested folders are converted to nested labels. They will display in Outlook as if they were nested folders. Adding a shared Exchange account to Outlook stops working. Adding an Exchange account (mailbox or calendar) to your Google profile in Outlook experiences intermittent problems. We recommend users either quit Outlook to switch between the Google and old Exchange profile or access Exchange through the web interface at https://mail.uas.alaska.edu. Recurring calendar meetings do not fully migrate to Outlook.